In my profile picture you will see a Moto Guzzi California II in white, this bike came to me with a knocking noise which started from around 2 thousand revs and stopped around 3.5 thousand revs. After a road test. I found the issue by stripping the engine and checking the con rods. The rods were egg shaped worn. This caused the bike to make the noise. With a engine out of the frame, second hand conrods, machined crankshaft to oversize shells. The bike was brought back onto the road. 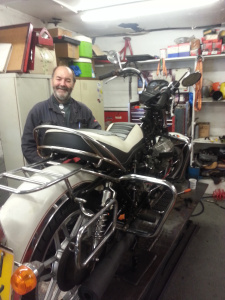 This bike had been seven years parked up so it was good to see a happy customer able to use the bike as it should be. No nasty noises and back out, on the open road.